This may be the end... or IS IT? Finishing up a game that I have been making for 3 years in batch and soon will be realsed for $.50 to an $1 . Also for what it may look like please watch this video. Hey guys check out my Destiny Beta play through and my Walking dead ep4. They are pretty funny things going on there! 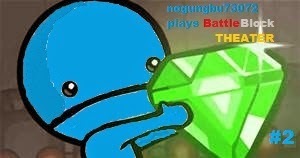 Check out the lateses and funniest installment in my lets play BattleblockTheater !!! Blogger being updated and soon will be more active.